While not the reason to purchase a pricey premium cabin ticket, these new amenity kits from United and Delta help make front-of-the-plane rides that much more special. Once United resolves and recovers from its system-wide computer glitch on July 8, premium passengers will be able to enjoy the carrier’s new partnership with Cowshed Spa, a premium spa and lifestyle brand from London, which is providing the personal care items in new amenity kits, in premium cabin lavatories and in about a dozen United airport lounges worldwide. The kits roll out Aug. 1, 2015, and will be distributed to premium-cabin customers (Global First and BusinessFirst) on long-haul intercontinental flights to and from the United States and will contain Cowshed’s moisturizing hand cream, Lippy Cow Natural Lip Balm and a Chamomile Refreshing Towelette. Striped socks, an eye mask, tissues, ear plugs, a toothbrush, toothpaste, dental floss and a pen will also be in both kits. The United Global First kits are a bit larger and also contain Cowshed’s Quinoa Hydrating Daily Moisturiser, Jasmine Toning Eye Balm and an eyeglass cleaning cloth. Look for Cowshed products in the shower facilities at United Clubs at ORD, EWR, Hong Kong, London and Tokyo and in United Global First lounges in ORD, SFO, DCA, London, Hong Kong and Tokyo as well. Delta One passengers will also be getting a refreshed amenity kit – and snazzy striped socks. 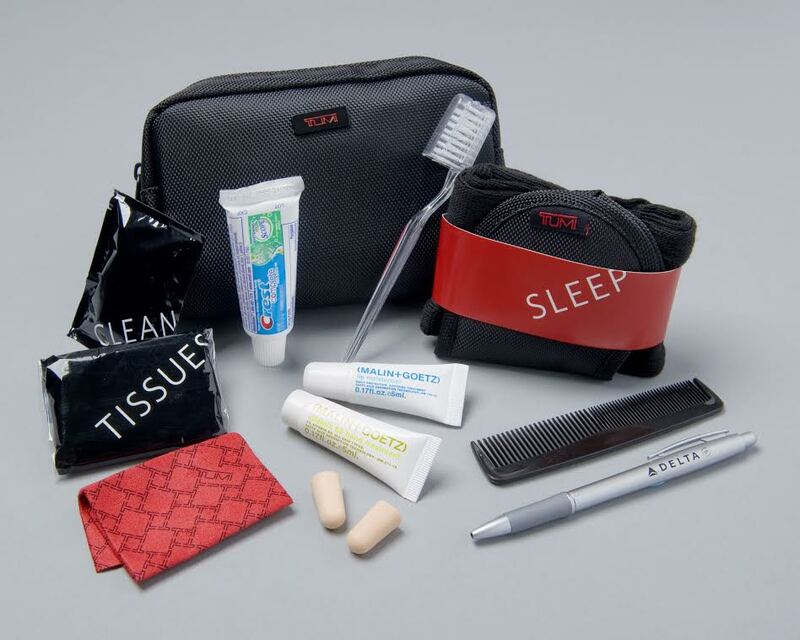 Delta has begun handing out hard and soft-sided TUMI amenity kits containing a TUMI soft-touch pen and eyeshades, MALIN+GOETZ lip moisturizer, body lotion and new mouthwash; striped socks, facial tissues, earplugs and a dental kit with Crest toothpaste. You may sleep, but your neighbor may be kept awake by the sparkle. Travelers hoping to avoid jet lag on a long-haul flight often don black eye masks in hopes of getting some shut-eye. They may look bland, but they work. But on Thursday, five lucky Virgin Atlantic passengers will be able to snooze in considerably better style wearing a limited-edition mask, decorated with $4,000 worth of Swarovski crystals. 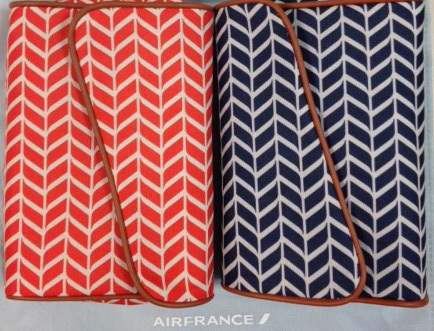 The airline introduced new amenity kits for its economy, premium economy and first-class passengers on Sept. 1. To celebrate, it’s tucking five swanky Swarovski eye masks — each with more than 3,000 red, white and blue crystals — in the amenity kits handed out in the economy section of five flights. The crystals were all hand applied (10 hours per mask) by Saima Anwar, an artist who also creates crystal eyelashes for celebrities such as Katy Perry. Thursday’s winners could include passengers on any of the airline’s flights to or from 11 cities in North America, including New York, Chicago, Boston and Los Angeles. Five eyeshades have been created to mark the launch of new amenity kits which are now appearing on board all Virgin Atlantic flights. “As the majority of our flights leave at night, arriving in London in the morning, we want to make sure our guests are well rested to begin their days, whether they be traveling for business or pleasure,” said Chris Rossi, senior vice president North America. Virgin Atlantic has been sweet on Swarovski for a while. Since 2003, the airline’s first-class cabins have featured Swarovski crystals on the cabin walls. Curtains adorned with more than 1,000 Swarovski crystals were recently added to the revamped first-class section on the airline’s A330 aircraft. While only five passengers will score the cool, crystal-encrusted eye-masks, the new, complimentary amenity kits are sure to be keepers. Each economy class kit contains one of the airline’s signature red eyeshades decorated with one of six sunglass designs, including one with heart-shaped frame and another in a shutter style. The premium economy kits are charcoal gray pouches made from recycled plastic bottles. The pouches have silk linings and are designed to double as travel wallets. Virgin Atlantic’s first-class passengers will be issued amenity kits made from the same recycled material, but their pouches will be big enough to be reused as holders for tablet devices or e-readers. Why upgrade an amenity that many other airlines don’t even offer to travelers in the coach cabin? “To enhance the customer experience to travelers in any class by offering a number of on- and off-board amenities not found with other carriers,” said Rossi.